The name Dandelion is a borrowing of Old French dentdelion, which means, “tooth of the lion,” a reference to the tooth-shaped leaves of the plant. It is difficult to overstate the value of this herb. In spite of the efforts to eradicate this “weed,” Dandelions continue to survive and ungrudgingly offer their benefits. Dandelions produce thick taproots that can penetrate up to several inches into the soil. These roots are one of the ways Dandelions manage to draw nutrients from the soil, making them bio-available to humans. The taproot is deep, twisted, and brittle. When the plant is unearthed, the Dandelion simply reproduces another plant from each of the pieces left in the ground. Dandelion acts as an extremely effective diuretic, but without the common side effect of mineral depletion prevalent with diuretic drugs. This is due to the fact that Dandelion contains all of the nutritive salts for the blood, restoring and balancing the blood in such a way that anemia caused by deficiencies of blood salts disappears. The plant helps control blood pressure by reducing excess fluids in the body, as well as by the presence of mannitol, a substance commonly prescribed in Europe for hypertension. Weight loss can release acid into the blood. Dandelion can destroy that built up acid, making it a welcome addition to weight loss combinations. A serum cholesterol and uric acid level reducer, Dandelion improves functioning of the liver, kidneys, pancreas, spleen, stomach and other digestive organs. Dandelion acts as a digestive, promoting or aiding the digestion of food. It begins its work in the mouth as a bitter herb, promoting secretion of digestive juices with its taste. This, in turn, helps the stomach do its work more efficiently. A hepatic (liver function aid), Dandelion is helpful in the treatment of jaundice, hepatitis and cirrhosis of the liver. It has a cleansing effect on the liver, increasing bile production. This action also helps the body rid itself of toxins utilizing other organs and systems, as well as having a cleansing effect on the blood, supporting the circulatory system. It is likely because of these properties that female organs, the pancreas, spleen, urinary passages and skin diseases benefit from the addition of Dandelion to the diet. Additionally, Dandelion relieves menopausal symptoms. A cholagogue, Dandelion stimulates the contraction of the gallbladder. This herb supports proper function of the spleen. Dandelion supports healthy kidney function. It is regarded as a lithotriptic, a substance used to dissolve and discharge urinary and biliary stones. In the colon, Dandelion acts as an aperient, or a mild laxative. The use of Dandelion is beneficial in the treatment of many other conditions. These include low energy, reduced endurance, abscesses, anemia, and boils. Dandelion is an anti-rheumatic, helping relieve and prevent rheumatism. Its balancing effects on organs that regulate hormones are what may account for its reported benefits in the prevention/treatment of breast tumors. Many people believe that Dandelion helps prevent age spots when the milky sap from the broken stems of leaves and flowers are applied. This same application is reported to help remove warts. As an anti-spasmodic, Dandelion helps relieve smooth muscle spasms. Dandelion is classified as a galactagogue, meaning it increases secretion or nutritional quality of a mother’s milk. Because Dandelion is rich in many nutrients, particularly in bio-available minerals, it not only enriches breast milk in nursing mothers, but it also benefits the nursing mother. A tea can be made from Dandelion leaves. The leaves can also be boiled and eaten like spinach. The young leaves can be used raw in salads. I find that Dandelion is a wonderful addition to soups and stocks. Dandelion should not be combined with prescription diuretics. Dandelion is not recommended for people with gallstones or viliary tract obstruction. Care should be taken to harvest Dandelion from an area that is KNOWN to be free of pesticides and other chemicals. 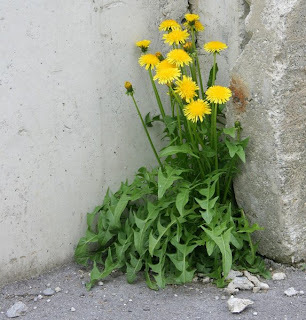 Dandelion plants growing next to buildings should be avoided as they have likely been contaminated with runoff from the building. Plants near roadways should be avoided as they have likely been contaminated by exhaust from vehicles. Wash harvested leaves carefully to rid them of debris and residue.